Cold soba noodles  are best served right away, so they are not my first choice for a bento. But I seem to always end up making too much and have to deal with the leftovers. The problem with bringing soba noodles for bento is that they really should be served cold, not at room temperature. You can use thermal bento sets like Mr. Bento to keep things cold, or ice packs. But the best way to deal with the coldness issue in my opinion is to freeze the dipping sauce. The frozen block of dipping sauce keeps the noodles cold, and will defrost enough by lunch time. Just put the sauce (a half cup is more than enough) in a freezerproof and leakproof container, and freeze overnight. If you are using bottled concentrated sauce (tsuyu or mentsuyu, such as this one ), you can mix it with water before freezing or freeze it straight and add a little cold water at lunchtime to thin it out. I’ve used my Fit & Fresh Breakfast Chiller  for this, but I left out the cooler ring to put in a bit more noodles. The dipping sauce was frozen in the liquid container (that normally is for milk) - it keeps the noodles cold while it defrosts. 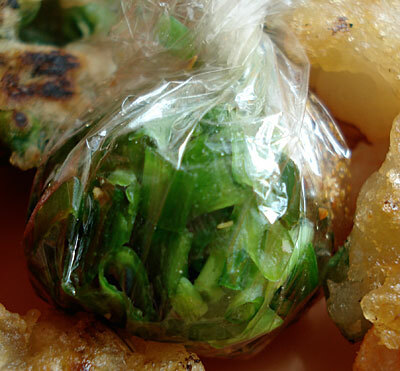 The top compartment contains the shrimp fritters  and some condiments (green onions and nanami tougarashi (seven-flavor pepper) in a twist of plastic wrap. 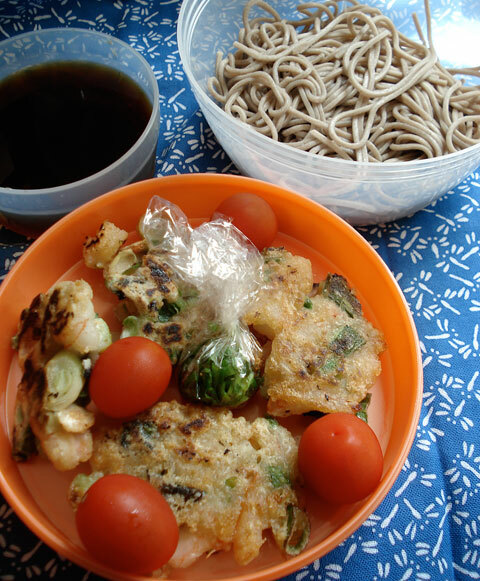 In any case, cold soba with a propery cold sauce is a nice change of pace for bento, especially in the summer. Store leftover soba noodles drained well and wrapped, in the coldest part of your fridge. Don’t keep them longer than a couple of days. If you plan to use soba noodles or other cold noodles for bento, make sure to rinse them extra well to get rid of any starchiness (see the instructions for cooking soba noodles ).